A Singaporean trader wanted by the FBI for allegedly helping North Korean entities evade US sanctions has fla tly denied "all charges" against him. Tan Wee Beng told the BBC that he had only learned of criminal charges against him via news reports. "Nobody has contacted me. The FBI has not called me, the Singapore police have not called me," he said. US Federal Prosecutor Geoffrey Barman on Thursday called Mr Tan "a fugitive from American justice". In the same justice department statement, FBI Assistant Director William Sweeney said the Singaporean "conducted illicit transactions totalling millions of dollars in support of North Korean entities in blatant violation of a host of economic sanctions the United States has established against North Korea and North Korean entities". 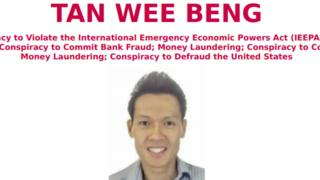 The US Treasury has now placed sanctions on Mr Tan and two companies he is connected to - Wee Tiong (S) Pte Ltd and WT Marine Pte Ltd. He is a director of Wee Tiong (S) and the managing director of WT Marine. Mr Tan, a high-pro file businessman, has over several years "fulfilled millions of dollars in commodities contracts for North Korea", the treasury department said. An US federal arrest warrant was issued for Mr Tan on 29 August but the Department of Justice announced its indictment against him on Thursday. He has been charged with conspiring to violate US sanctions, as well as bank fraud and money laundering. "I found out only today through the internet. It came as a shock to me," the 41-year-old told the BBC in a phone call on Friday morning in Singapore. He said he denied all the accusations. "We are an international trading company, and not a front [for laundering]," he said, adding that he had instructed lawyers to defend him. Mr Tan also disputed claims by the FBI that he was "at large". A request for comment ha s been sent to Singapore police. The US and Singapore have an extradition treaty but it only covers specific offences and does not include money laundering. Mr Tan was once seen as a leading young Singaporean entrepreneur having been named an entrepreneur of the year in 2011 by leading accounting firm EY. Under his stewardship, annual revenue at Wee Tiong increase by 131 percent in a decade to more than $460 million Singapore dollars ($330m), the Straits Times reported in 2015. Actor Robert De Niro and Vice-President Joe Biden are the latest to receive suspected bombs by post. What happened to the 2nd Platoon? Who supports Brazil's far-right candidate?